Cerebral aneurysms of the anterior circulation include those that arise from the internal carotid artery (ICA) or any of its terminal branches. Although the indications for an endovascular approach to aneurysm treatment continue to expand, microsurgical treatment remains the preferred option for many patients with select anterior circulation aneurysms. The established durability, versatility, and effectiveness of microsurgical clip ligation for treating anterior circulation aneurysms set the standard by which all newer technologies must be judged. 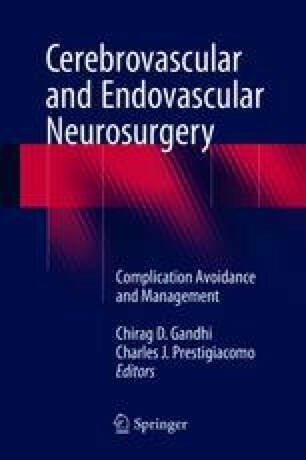 In this chapter, we provide a comprehensive review of the considerations necessary to effectively treat anterior circulation aneurysms microsurgically while avoiding common pitfalls (Table 13.1). In addition to reviewing the salient general preoperative and intraoperative matters of relevance to anterior circulation aneurysm surgery, we also discuss the specific considerations for aneurysms in each location.